In a significant move, organisers of the America’s Cup have announced that the proposed AC62 race boat may be ditched in favour of smaller, cheaper AC45s, opening up the 2017 competition to new teams. 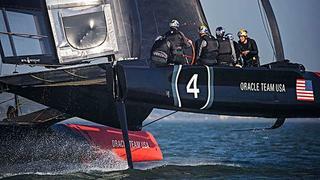 If confirmed, the change would dramatically reduce the budget required to compete in the America’s Cup. The original vision for the 2013 Cup was for a far deeper field – and hence more exciting racing – than ever before, and one of the few disappointments in a successful competition was how few teams made the start line – generally for commercial reasons. In the official statement, Sir Ben Ainslie, skipper and team principal of Ben Ainslie Racing and a Boat International columnist, also expressed his support for the move, labelling it a “necessary” move that will still provide a real challenge for sailors and designers. The proposals were initially put forward to competitors early last year, but just two teams – ORACLE TEAM USA and Emirates Team New Zealand – gave their support. Now it seems that the majority of competitors have been won over after watching how the prototype AC45s perform. The rule changes are being drafted and will be put to the teams for a vote before the end of March.